TRAVEL AND LEISURE IN BORNEO: LIKAS BAY: Chakoi the Chinese doughnut! These Chakoi are delicious! It's crispy, not oily and hot. I stumbled upon it during the Dragon Boat Festival at Likas Bay. It looks so appealing that I bought three "pairs" on the spot and within minutes finished all of them! When I was a small kid, Chakoi used to be sold everywhere; especially in any Hainanese coffee shops and also in wet markets. Nowadays it seems quite difficult to find them until I found it here at the festival. 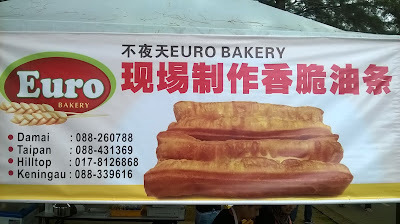 This stall was operated by the Euro Bakery and their Chakoi is good. Chakoi originated from China where it is call Youtiao. Basically it is a Chinese cruller or Chinese oil stick. It is in fact a Chinese doughnut. Chakoi spread out to Taiwan, Vietnam and then throughout Southeast Asia following the Chinese diaspora during the 1800's and early 1900's. 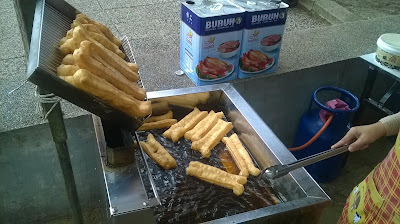 Actually it is known as Char Kway in Malaysia, Singapore and Indonesia but since large number of other races also make this doughnut, it is conveniently called Chakoi. Chakoi used to be Southeast Asian Chinese cuisines normally taken with soy milk and rice porridge during breakfast. For a Chinese, Kway or Qui or Kui means ghost or devil. The Taiwanese call this food Cha Kui. The Cantonese call them Yau Ja Gway; which literally mean oil-fried devil! According to ancient Chinese folklore, Chakoi was made as an act of protest against a hated official of the Song Dynasty, Qin Hui. The reason Chakoi could be easily split in two (because it is lightly made) was to represent it with Qin Hui and his wife! Indeed this is a tasty little devil!